I recently wrote an application to attend the Do Lectures in Wales. True to the character of the event, the application required handwritten responses to a set of questions, the first of which was, ‘Who are you?’ in 50 words or less. I described myself as a nomad. But for me being a nomad has a professional meaning too. As a consultant I do my work in other organisations. The approach we take to our work means we make considerable effort to immerse ourselves in the life of the organisations we serve. We live in their environment. When it’s time to move one, we pack up our stuff and move on, hopefully leaving the environment in better shape than we found it. Being a nomad has a certain romantic appeal. The idea of being at home wherever we lay our hat is kind of cool. And there is a good deal of truth to the perspective that being a consultant is a privileged existence in that every new project ushers new knowledge about an industry and the particular culture of the organisation. I was born on September 11th, the same year JFK was assassinated. There was nothing special about my birthdate until the turn of the millennium. On September 11th 2000 the World Economic Forum came to Melbourne at the height of the anti-globalisation sentiment. The day became known as S11. The community with which I identified was associated with an event on the day beforehand which was designed to be a celebration of the elements and initiatives in society which enhanced social justice. This was our attempt to be positive rather than protestant. The day was dubbed S10, and it was a fantastic day of community spirit, held in Treasury Gardens adjacent to the Government Offices. However, it would be my experiences on S11 that would be a parable for one of the significant transitions in my life. During the morning I participated in the street festival that formed part of the protest outside the blockade of Crown Casino where the 200 Forum delegates were meeting. Occasion appropriately I wore jeans, Blundstone boots and a suitably scruffy top. At the time I was in transition between my work in the community sector and consulting in the business world. By the afternoon I was in a cotton short sitting in a corporate Board Room. The point here is that I’ve always managed to feel at home in disparate social environments. In fact I enjoy the variety. I’ve not felt a contradiction within, but sometimes I’ve wondered about the authenticity of it. Where do I belong? In the street, or in the office? 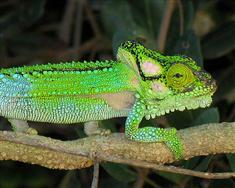 The skill of the chameleon is to adapt to their environment. But the motive is invisibility. I wonder whether I am confident enough in my identity and contribution to be strongly who I am. Do I just conform to whatever environment I am in? Perhaps I am a chameleon? I am acutely conscious of how my experiences along the way have shaped me. Perhaps I should more aptly describe myself as a pilgrim. Everything is connected. At a micro level we experience this within our bodies; when one part is in pain our whole self suffers. We understand that our physical, mental and emotional states are related in curious ways. Within our families and friendship groups, among those we love, we feel collective joy and anxiety and the gamut of emotions. Any decision made by, or event experienced by one member can have significant influence on the lives of others. As we keep extrapolating out we realise we are connected with all humanity, and ultimately with all living things. Ideas like this, ideas that used to be considered the domain of odd people on the margins of mainstream society are now increasingly appreciated as foundational principles of cultivating sustainable societies. So our journey through life is not as an independent being, a parasite on the earth or a maverick in the jungle of urban living; rather we are pilgrims, shaped by our engagements with each other and the challenges and opportunities life offers us. Pilgrims do not wander aimlessly. They are called by a deep, identity shaping belonging. Sometimes it has an outer world expression, but mostly, pilgrimage is an inner journey towards love, peace, justice and joy. Rarely do pilgrims journey alone. Pilgrimage is normally a community affair so our natural instinct is to find those who we can travel alongside. In this digital age, the connections we cultivate with fellow pilgrims are not limited to face to face relationships. This has always been the case to some extent. Before the internet I considered some authors as mentors and fellow travellers and I would do my best to meet them when the opportunity arose. These days those opportunities are multiplied as we find kindred spirits through various social networking technologies. And so I will think twice before describing myself as a nomad, even though the characterisation of a nomad as travelling but not being changed is often true of me. In my struggle to be comfortable with who I am and how I conduct myself in the world, it is also true that I sometimes behave like a chameleon. But I will strive to be less like a nomad and less like a chameleon. I will seek to be a pilgrim. Funky? No. Generative? I think so.